I am way behind in my blogging. So sorry! My main squeeze updated our software and now I can't drag my pictures where I want them to go. Does anyone else have this problem? Anyway, I am finally posting about the awesome 4th of July we had. I had been wanting to do this hike at the Oneonta Gorge (just off the Columbia River Gorge) for ages and we finally got the chance. I wanted to wait for a hot day as I was told that we would have to hike through a river to get to the waterfall at the end. Then I was told that in some parts the river would be up to our waists. Yikes! It was true. What I didn't know was that there was a huge log jam we would have to climb over to get to our destination. So without further ado, here are a few pictures (out of order of course) of our hike. This was our reward at the end of the hike. Here's the gang, minus me, ready to hike. Daughter and "the boyfriend" waist deep in the river. It really was such a beautiful setting. The only negative to the hike was on our way back a young mother had fainted and her poor husband with two little boys and a little girl in a back pack was calling for help. My guy ran to help and then ended up carrying her out. The husband confided that they just found out that she was pregnant. An ambulance was called and she was resting in her car when we left. We then made out way to two more waterfalls, Horsetail Falls where we had a picnic before hiking to the lovely Ponytail Falls and then on our way back home we stopped at Wakeena Falls. So pretty! I wanted to keep going and find more places to hike, but everyone else was pooped so we headed home. Got a few hours of rest before we headed out again to a big fireworks show in Oak Hills (near Portland). Unfortunately, as my husband was running to help, he dropped the camera so we didn't take anymore pictures as we thought the camera might be broken. It wasn't, just a little bit wet. Tomorrow I am headed to the Portland Antique Expo to help Isabel get set up for the sale. I plan to do a little shopping as well. If you are headed there, I hope to see you. Just look for us at booths number 147 & 148. 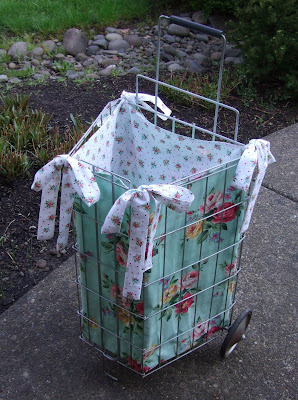 Or, if you see me walking around with this shopping cart, stop me to say hi. Coming up: Recent Vintage Finds, Family Fun-Part 2 and Dreaming of Paris, Part Deux. Amazing! The waterfall is gorgeous and you all are dwarfed by the massiveness! What an amazing place. Have fun at the expo! Sweetpea, your updating your software should not have anything to do with rearranging your pictures. I simply copy and paste them after uploading them to blogger and arrange them as I like. If you need any more help, get in touch with me via my email which is on my profile page, honey. Happy to try and help. Oh my gosh, I almost lost my breath when I saw your daughter and friend in the water. That was such a thrilling post to read. The photos were fantastic...not the least bit water logged! Gotta admit we are SO SPOILED with living in the Pacific Northwest .... Hope to see you at EXPO! What a wonderful place! I love places like that. It's lucky that you were there to help out. Let's hope she is well now. I do hope to make it the show tomorrow and see your booth in person. What a gorgeous waterfall...It looks so peaceful..Love the colors to..What a fun post...Thanks for sharing.. Wow!!! What an adventure! The place is breath taking.Have fun and god bless.